In 2016, the theater “Kryly Khalopa” began the project Brest Stories Guide – a series of documentary audio performances in the city space. There is a significant layer of history, poorly represented in school textbooks, Belarusian museums and tourist routes. German genocide against Jewish communities is one of the topics traditionally closed in the Soviet Union. The murdered Soviet Jews were stereotypically called just “peaceful civilians”. After the USSR collapsed, the single studies on the Holocaust appeared, but so far the people of Belarus have been little aware of the fate of their fellow citizens and the scale of this crime in Belarus. The focus of the project Brest Stories Guide is anti-Semitism and the destruction of Brest Jewish community in 1941-1942. Before the outbreak of the war, there lived approximately 24 000 Jews in Brest (about 45% of the city population). Almost all these people perished. Because of the Holocaust and the city natives’ repatriation, as well as Soviet anti-Semitism, the memory of the Jewish community and its contribution to the development of Brest disappeared from the city. Today we can say that the biggest catastrophe and trauma of the city life are not present in its memory. With the project Brest Stories Guide, our theater states that the Holocaust theme concerns not only Jews and the past but also the problem of people excluding in the modern world. The one, who remains indifferent to these events, will remain indifferent to the new crimes that allegedly “concern only others”. An audioplay – a tour around a “nonexistent” Brest – is based on materials from the archives, books, photos, interviews with witnesses of the events related to the anti-Semitic manifestations since 1937, the Brest ghetto and the obliteration of the Jewish community in 1941-1942. In addition to the memories of surviving Jews and Brest citizens, there also were used the unpublished reports of German officers from the archives. The play becomes a kind of investigation with the hearing of witnesses in the case of anti-Semitism and the Holocaust in Brest in the 1930s and 1940s. Now Brest has a history told not by the authors of textbooks and the creators of heroic narratives, but by its inhabitants. 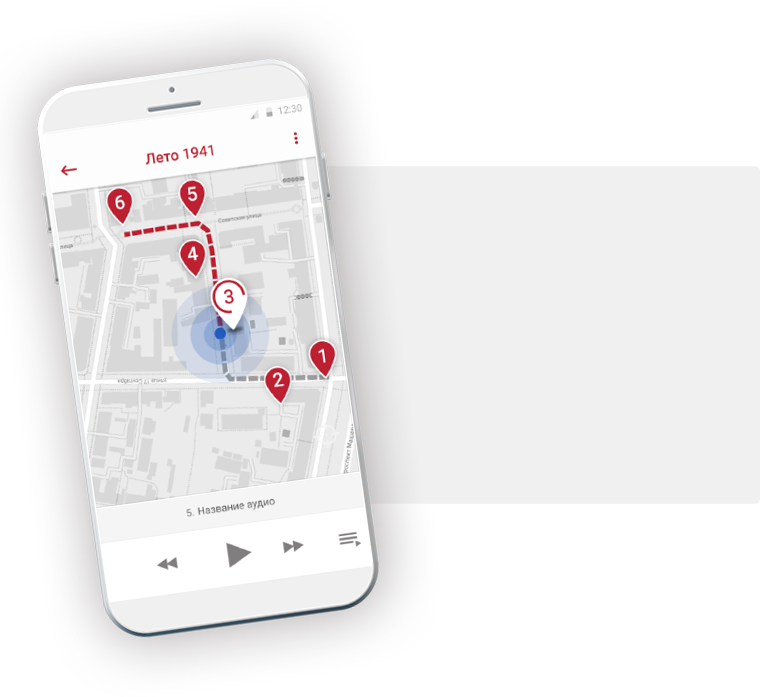 The mobile application consists of the audioplay and a city map which allow the user to navigate freely on the map with key places of Jewish heritage and historical events. Streets, buildings and yards become a stage on which the voices from the past sound. The “Kryly Khalopa” theatre offers the viewer / listener to plunge into the history, and also see the outlines of a disappeared, old Brest appearing through the face of today's city. Brest Stories Guide is a project at the intersection of art, tourism and cultural heritage preservation, the result of the co-work of about twenty people, including historians, the experts from Jewish organizations, as well as the best actors of Brest theaters. That makes the project both an innovative tourist and art product, and a reliable source for studying the city history. What makes the project unique is that it does not just invites us to use our imagination but refers to the most sensitive zones of our missing and “clear” memory, causing painful reflections as we need to imagine even the ruins. ...In the play, where the city and the voices constitute its decoration, physical and emotional experience of the audience becomes its most important part, when imagination of a person becomes a theater stage or a screen. What kind of projection or interpretation of the play, its voices and monuments will appear on that screen depends entirely on the person, who is listening to the audio-play in the city. When you walk this play down in the city, what appalls you most is not the absence of the objects and people mentioned in the city space, but their absence in our memories, our common tendency to destroy our memory and this is when your eyes reflect emptiness both from the outside and from within. Brest Stories Guide fills in the emptiness and helps you see the ruins and recover the memories, which bring you back to your history and invite you to embrace it. “The “Kryly Khalopa” theatre does what historians, museum workers, teachers, journalists and publicists should do, looking for places in the city and the stories related to Brest Jewish community, discrimination and the obliteration of this part of the urban population – with a goal to preserve the memory of the people killed and make this important part of Brest's history available to all. The project Brest Stories Guide enables Brest citizens and tourists to get acquainted with the forgotten history of the city, listening to the words of witnesses, victims and participants of a mass crime, which has had no analogues in the history of the city. Voices from the past invite the contemporaries to think about the culture of memory (in fact, the slogan “Nobody is forgotten, nothing is forgotten” is still popular, which obviously does not correspond to the reality), and about our attitude towards the discrimination and exclusion of certain groups of people from the society. Therefore, I believe that the Brest Stories Guide is a project connected not only with historical memory, education and art, but also with important ethical issues”. The audio-play excursion transmits you into a parallel world and makes you to take back into present life a part of responsibility for the things done in the past. I think that Brest would never be the same to me. … You can listen many times the lectures about Holocaust, but none would replace the experience of reliving the stories in the space, where they have taken place. I mean the power of art, of its modern forms, which are on the crossroads of the theater, urbanism, historical studies and many more... Listening to the stories of the witnesses of these awful events while you walk in Brest is the same as to put on their shoes and to see the buildings, pavements and the city routes from a totally different perspective recalling again and again what you have recently experienced. ...I would advise to expand Brest Stories Guide into a national memory guide by creating a Holocaust media map of Belarus. This is an ambitious project to accomplish - 326 residential areas, where around 800 thousand people were killed. The project was realised with the support of the CHOICE: Cultural Heritage - Opportunity for Civic Engagement.